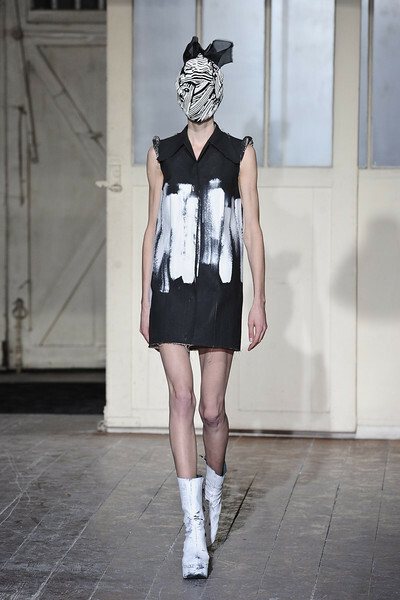 Pretty Capricieuse: DIY Haute Couture S/S13 Maison Martin Margiela stripes T-shirt. DIY Haute Couture S/S13 Maison Martin Margiela stripes T-shirt. In a very few weeks, the stripes trend will be strutting the pathways in college EVERYWHERE—and I don’t want to look like everyone, wearing this one same shirt. No, I would be wearing my own DIY striped T-shirt inspired from the very Haute Couture runway of Maison Martin Margiela for this Spring/Summer 2013! Check out here my secret for how to make yourself look different from the rest! Make sure that the T-Shirt is flat or iron it before anything.Lay the T-Shirt flat on the table and insert a towel/paper inside of it in away that it covers all the front part beneath it—we don’t want the white paintto stick to the back of the T-Shirt. Do not dilute the color with water unless it is said so on the paint bottle. Pour some paint in the recipient and roll over the paint roller. Have the picture of the original garment ready in front of you, and start reproducing what you see. Don’t be afraid to be creative, both the original garment and the one in the making are not going/meant to be identical. When you’re done, let dry overnight (it is safer) keeping the towel/paper inside the T-shirt or follow the instructions on the paint bottle you are using. The next morning, lay the inside of the shirt on the ironing board, place a linen cloth on top, and iron it for 5-10mn to fix the color on the garment. Pébéo’s colors for fabric are resistant to washing at 40˚C(100˚F)—after fixing color with an iron. Concerning this matter, the paint bottle you are using should have similar instructions to pébéo’s. Also, before proceeding to the wash, do not forget to verify what washing method the T-Shirt requires and adopt it. For instance, the cotton T-shirt might not support awash in machine, yet, certainly, a hand-wash will always work! If you want to iron the T-shirt after washing, remember to place a linen cloth on top of it or instead, iron it inside out. How creative you are ! !